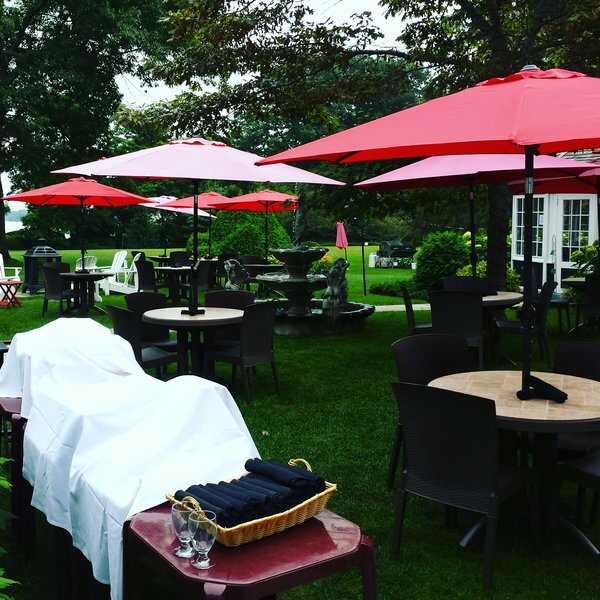 During a recent trip to Jackson’s Point, we decided to stop in for lunch at The Briars Resort. 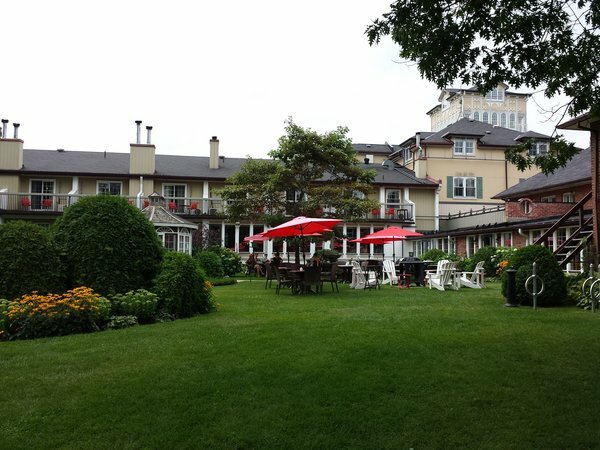 The Briars is a Lake Simcoe institution, that features a championship Scottish woodlands golf course, fine dining, spa, outdoor and indoor swimming pools and frontage on the Lake Simcoe shoreline. Our server immediately arrived and brought us a bottle of water while we perused the menu. I decided on the Grilled Vegetable and Feta on Naan with Chipotle hummus and pea sprouts, $13, while my dining partner ordered the daily special: Breaded Tilapia with rice and veggies, $13. 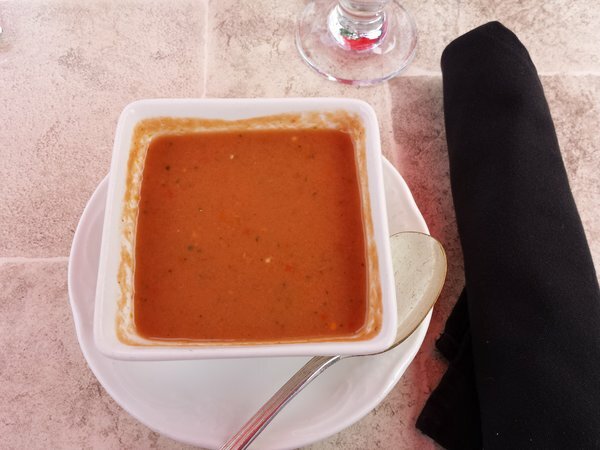 My order came with the soup or salad so I opted for the daily soup: Gazpacho. My dining partner’s dish did not come with appetizers, but she decided to order the Gazpacho as well. After we finished our soup, our entrées arrived about five minutes later. 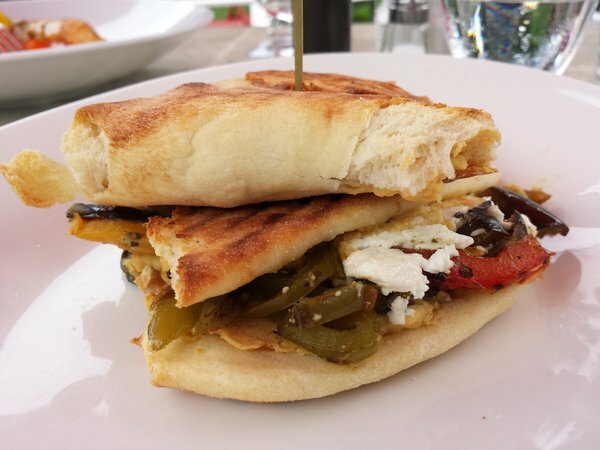 My grilled vegetable sandwich had a wonderful filling of grilled eggplant, peppers and zucchini, an indulgence of soft goat cheese and some heat from the Chipotle hummus! All of the flavours melded beautifully. I would have preferred the naan to be less dense than it was. As a result, I ended up removing the top lid of the sandwich and just eating the base. The star of the afternoon turned out to be the Tilapia daily special. The fish was delicate and light while the breaded coating was barely there, just enough to keep the fish moist while cooking. Absolutely melt-in-your-mouth. 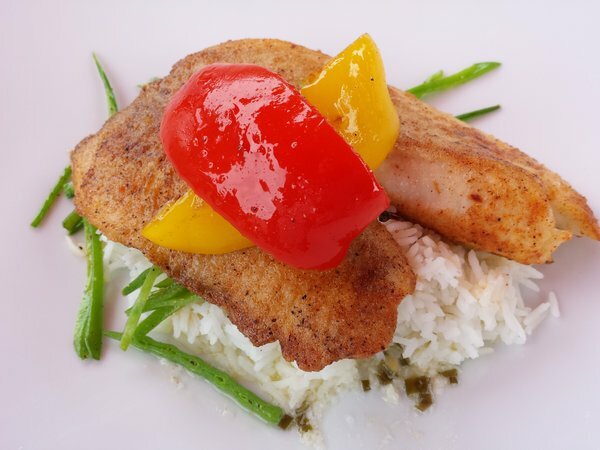 The Frenched-cut green beans were the perfect complement to the fish since their thin slices matched the soft texture of the fish while the rice tasted superb, dressed in a very light olive oil and lemon sauce. Five stars! My dining partner opted for the Chocolate Ice Cream with homemade cookie, $9, for dessert. 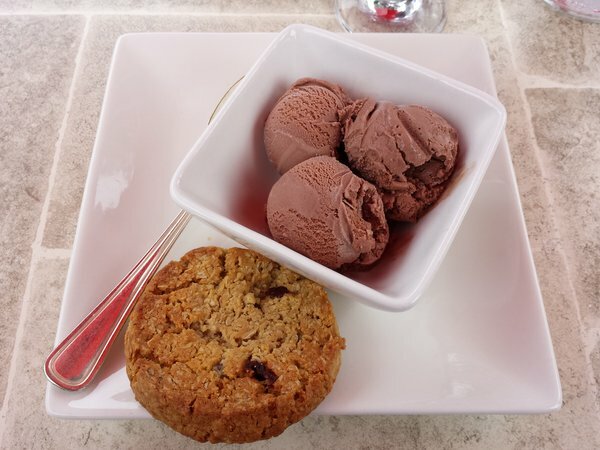 She said the ice cream was good, but the cookie, made with oatmeal and cranberry, was divine. After lunch, we decided to take a walk down to The Briars’ private beach on Lake Simcoe. 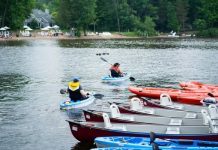 There were many chaisse lounges set up for guests, as well as canoes, kayaks and pedal boats for guests to use. 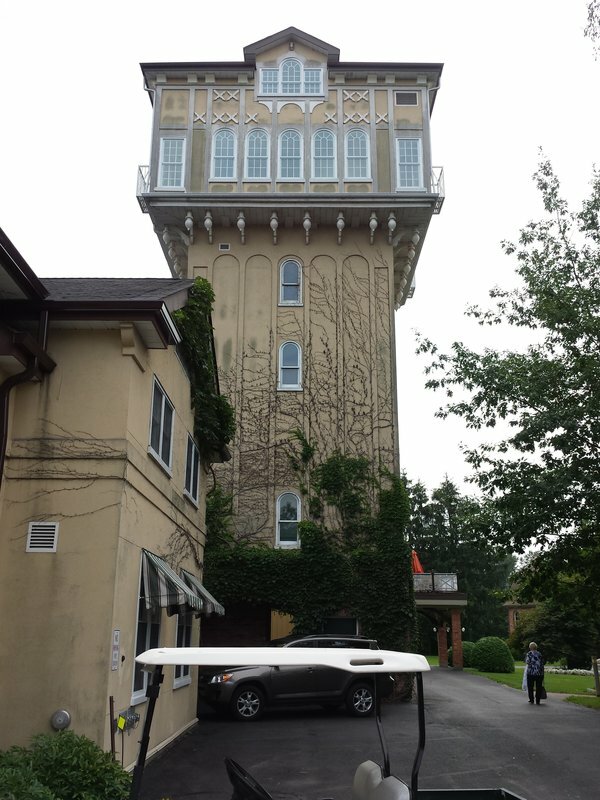 As we walked around the grounds back to our car, we saw the gorgeous tower attached to the main building. We also had a peak in the library. Wouldn’t this be a comfortable spot to read a book? It was the most perfect afternoon spent enjoying lunch at The Briars. I highly recommend it if you are looking for a restaurant that isn’t too far from Toronto, but just far enough to forget the city. What a gorgeous view and a great place for lunch! The food looks absolutely delicious and that ice cream? Yum!! This would be the perfect place for a lunch date or even a family lunch! Looks like a lovely place to enjoy a nice lunch with friends. I would love to go here with my BFF. THe food looks amazing too but the gardens around the resort looks even better. So relaxing and beautiful. Not only does that place looks like a beautiful backdrop and atmosphere for enjoying food but those pictures of the food have me drooling. Oh Yummy! Everything looks so perfect, I would love to go there and try this out. Here in Iowa they have such little options for decent food so traveling just to experience good food again is not entirely out of the question for my family. Wow! I love places like this. I love the private beach. This place looks so peaceful and kind of elegant too. It sounds like it’s not that pricey either. Such a great brunch time place to be. This is embarrassing to admit but I’ve never been to cottage country and I live in the GTA. I’ve been almost everywhere else, except North of Newmarket. 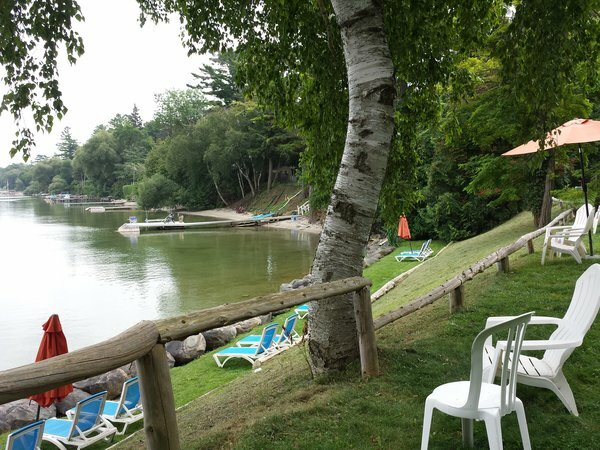 Lack Simcoe area and The Briars Resort look like a lovely place to stop on an adventure. Thanks for sharing! The goat cheese on that sandwich just looks so divine. That is something I would definitely order! 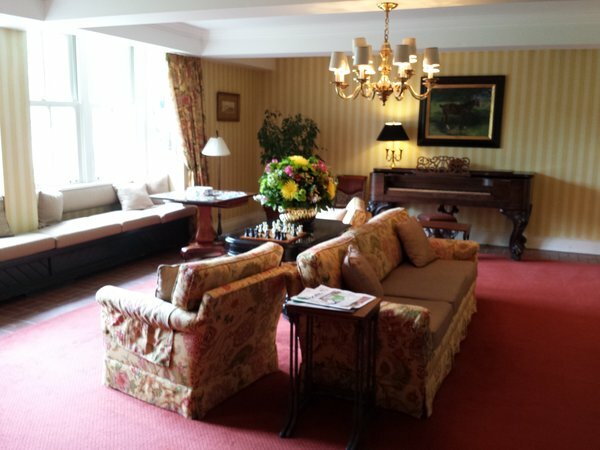 As a self-proclaimed foodie, the Briar’s Resort looks like an excellent spot to dine! The breaded fish’ presentation looks delicious and the desserts made with ice cream and cookie pairing is perfect to wash down the flavors. I also love the ambiance outside. The lake is calming and soothing. I’d love to visit this place for a short stay. 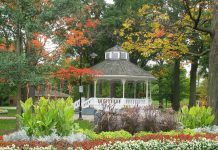 This looks like a lovely place for a day out with friends for a nice lunch outside. When we go out to eat, if the weather allows, we always try to sit outside, enjoy views and fresh air. The food looks delicious, especially the breaded tilapia! What a stunning place to get away. And that soup looks amazing and I am so craving ice cream right now. The cookie with oatmeal and cranberries I bet was delish! This looks so idyllic. The perfectly manicured lawns are such an awesome sight! I can imagine myself having tea in one of those outdoor tables and just taking in the view. The food is fantastic too. 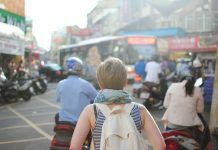 It may be too late to squeeze in a vacation there this year, but we’ll make sure we save up for it for next summer! I like the private beach.